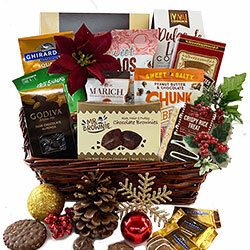 One can never go wrong with chocolate and nothing says “Happy Holidays” or “Merry Christmas” better than a mouthwatering Christmas Chocolate Gift Basket that are not only inspiring but delicious too. 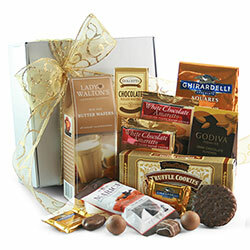 Our chocolate gifts are comprised of a stellar collection of Godiva, Ghirardelli, Marich and Lindt. 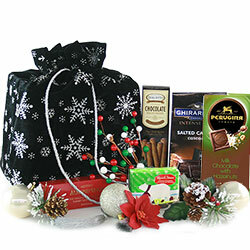 Indulge your clients, friends and family with our Christmas Chocolate Baskets always get rave reviews! 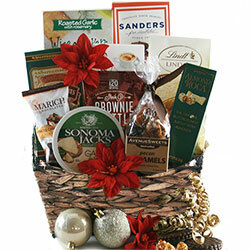 We also have a wide variety of Christmas Baskets to please anyone on your gift list. Christmas Morning Wake-Up Call – While the kids have barely slept a wink and are bursting with excitement to see what Santa brought them, the adults could use a few more hours of shut-eye. Since that’s out of the question, stock up your friends and family with holiday coffee gift baskets that have the caffeine kick they need in the wee hours of Christmas morn. They simply need to reach into the basket, grab one of the delicious flavors, and start brewing. Hosting Parties – Tis the season and most people will be celebrating in big groups of some type. 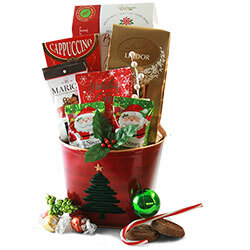 Giving coffee baskets for Christmas, sets up the hosts for these festivities with some post-dinner coffee for their guests. Instead of going to the grocery store to fill the cart with extra grounds, your gift recipient can just reach into their basket to put out a variety of name-brand brews. Hot Toddies – Cold weather means curling up in front of warm fires with hot toddies. The holiday season brings with it its own set of traditional “hot toddies,” which now encompass much more than their original form and include alcoholic egg nog, hot cocoa, and coffees. If you know someone who loves to whip up a festive creation with a hot beverage, give them a Christmas coffee basket so they have all the tools they need. Bert and Ernie, macaroni and cheese, unicorns and rainbows…some things just go together and are best experienced as a pair. That’s the way we feel about Christmas and coffee. 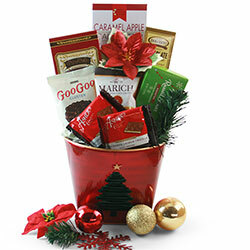 Our Christmas coffee gift baskets are bursting with glad tidings, sugar highs, and dark roasts. In other words – a perfect holiday package. 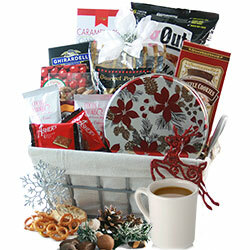 Send your favorite caffeine fanatic the Cafe Amore Coffee Gift Basket, which includes coffee from brands like Coffee City and Coffee Masters. 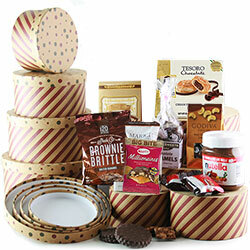 Those flavorful brews are complemented by chocolatey items such as biscotti, wafer cookies, and Belgian biscuits. If that’s not sweet enough for you, we’ve got a wide selection of other Christmas chocolate baskets that feature coffee and the most delicious treats. Speaking of perfect pairings, chocolate also happens to be quite the match for a nice glass of wine. And what’s a holiday season without a few toasts during the festivities? Browse the “aisle” of our Christmas wine gift baskets to find something special for the oenophiles in your life. 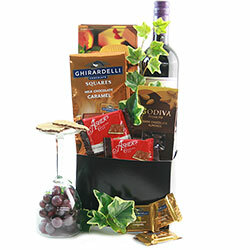 A favorite of Santa’s is the Chocolate & Red Wine Christmas Wine Basket. 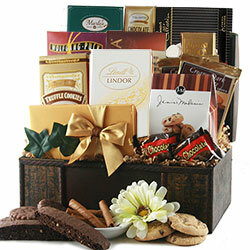 It includes a bottle of wine (your choice), chocolate cream puffs, Lindor truffles, dulce de leche cookies, and more. Our Christmas chocolate gift baskets are all carefully curated by team members who have an eye and taste for the best holiday flavors. 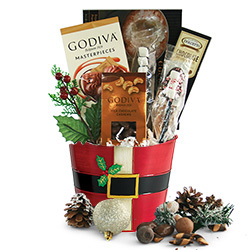 That’s why, year after year, our Christmas gourmet gift baskets are best sellers. 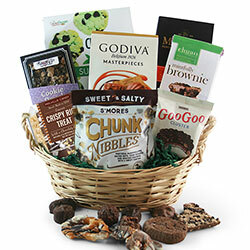 Even the most discriminating foodie will appreciate a basket from you that’s full of savory cheeses, toasted crackers, and sophisticated sweets. 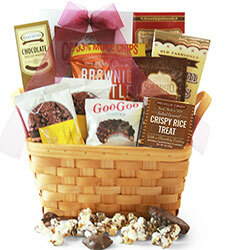 We have a large selection with different combinations of flavors to choose from.